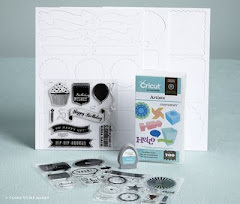 Crafty Happiness: New Consultants Get a Fab Freebie! If you have considered purchasing a Studio J membership, then Close To My Heart has the deal for you this month. 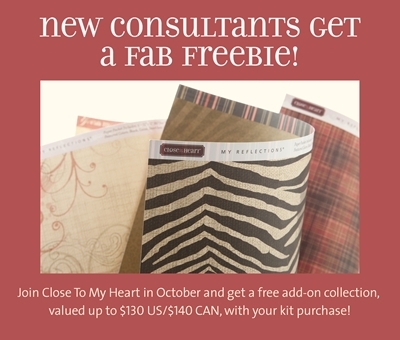 Sign up as a new consultant between OCTOBER 1–31 and receive one New Consultant Kit add-on collection of your choice FREE! Add-on collections are priced at $40 each and have a retail value of up to $130, making this an incredible deal! One of the optional add-on collections is a 12-month Studio J membership and FIVE Studio J layouts. For just a $99 enrollment fee, you'll receive a New Consultant Kit packed with business essentials and new products valued at over $280, plus a FREE add-on collection to enhance your kit! Then you can choose to buy one or both of the other add-on collections for just $40 each.